Grieving protocols intensified in the Australian colonies throughout the second half of the 19th century, following the model set by British monarch Queen Victoria, who assumed perpetual mourning after the death of her husband Prince Albert on 14 December 1861. Wealthy widows like Irish-born Sarah Osborne would have commissioned photographic mourning portraits of deceased loved ones to send home to friends and family. This painted memorial portrait may also have been based on a photograph, capturing her grief at the death (from stomach cancer) of her husband of 50 years, as well as the loss of her sixth son (18-year old John King Osborne) to consumption just three weeks later. 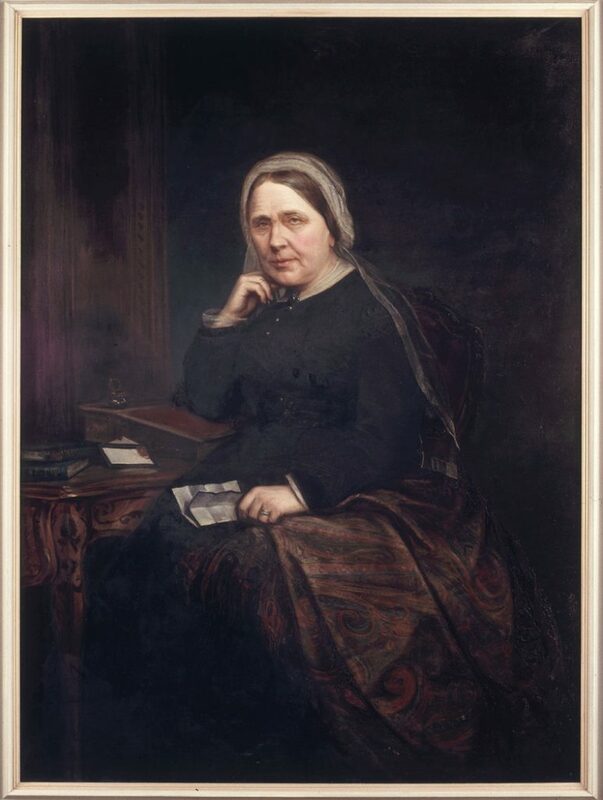 Sarah Elizabeth Osborne, nee Marshall (c.1807-1874) arrived in Australia from Ireland in 1829, with her husband Henry Osborne (1803-1859); the couple had nine sons and three daughters. An extremely wealthy man for his time, Osborne became a person of influence in the NSW Illawarra/Southern Highlands area. Elected a member of the Legislative Council in 1851, and elevated to the Legislative Assembly in 1856, Osbourne died on 26 March 1859. Henry Osborne was the youngest of the ten children of Archie Osborne of Dirnaseer, County Tyrone, Ireland. Two of Henry’s brothers had migrated to NSW and its was on the advice of one of them that Henry sold his farm and other property for about £3000, investing in a consignment of Irish linen and booking passage to Sydney on the Pyramus. Deeply in love with Sarah Marshall, daughter of an Irish clergyman, Henry’s previous proposal had met with her father’s refusal. When the Pyramus entered Belfast Harbour, Henry went ashore and immediately headed for Dromore, County Down, to persuade the Rev. Benjamin Marshall to agree to his daughter’s marriage, to which he duly consented. Within a week the whole parish had set furiously to work to provide Sarah with a trousseau. This accomplished, the wedding took place on September 11, 1828. The newlyweds set sail for Sydney where they arrived in May 1829. Osborne sold his linen at a handsome profit and went work on the property of Captain Thompson at Liverpool, where he gained valuable colonial experience before settling down to life as a pastoralist in 1833, on a grant of 2560 acres (1036 ha) in the Illawarra near the present town of Dapto, NSW, naming his property Marshall Mount. The Osborne’s first home near Lake Illawarra was known as ‘Pumpkin Cottage’ (See: ML SV1B/Illa/2: watercolour by Robert Hoddle, 1832). The Osborne’s new residence Marshall Mount House was completed in 1841, built in the ‘colonial style’ of ‘stone with lovely cedar doorways and an elegant staircase with slender balusters, an oval light over the deep set front door and French windows leading onto the stone paved verandah’. Now a suburb of Wollongong, located between the larger centres of Dapto and Albion Park, Marshall Mount house survives to this day, in poor condition. Sarah died in England on 24 February 1874.